To many contemporaries the sinister black skeleton evening dress with its padded representations of human bones was an outrage - an offence against good taste. 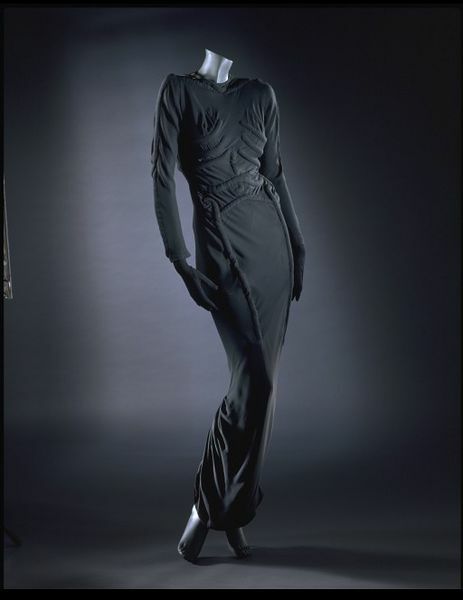 Although otherwise in elegant harmony with the prevailing lines of late 1930s evening wear, the skeleton dress is so constricted that it became a second skin and the imitation anatomy sat defiantly proud of the fine matt silk surface. 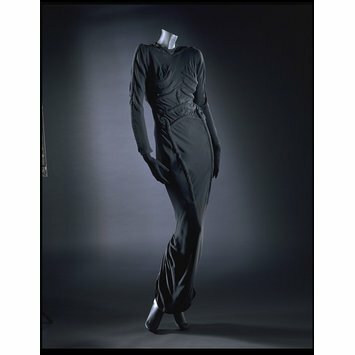 Schiaparelli exaggerated the usually delicate trapunto quilting technique to make enormous 'bones' - the design was stitched in outline through two layers of fabric, then cotton wadding inserted through the back to bring the design into relief on the front. The shoulder seams and right side are closed by bold plastic zips. Black evening dress and petticoat of silk crêpe, with exaggerated trapunto quilting technique to make enormous 'bones'. The design was stitched in outline through two layers of fabric, then cotton wadding inserted through the back to bring the design into relief on the front. The shoulder seams and right side are closed by bold plastic zips. Back hip: seductive end of tailbone. Does have a waist seam. Below waist seam there is a triangular insert ending at the coccyx (very Jamesian). Two side zippers (4 zippers total on dress). 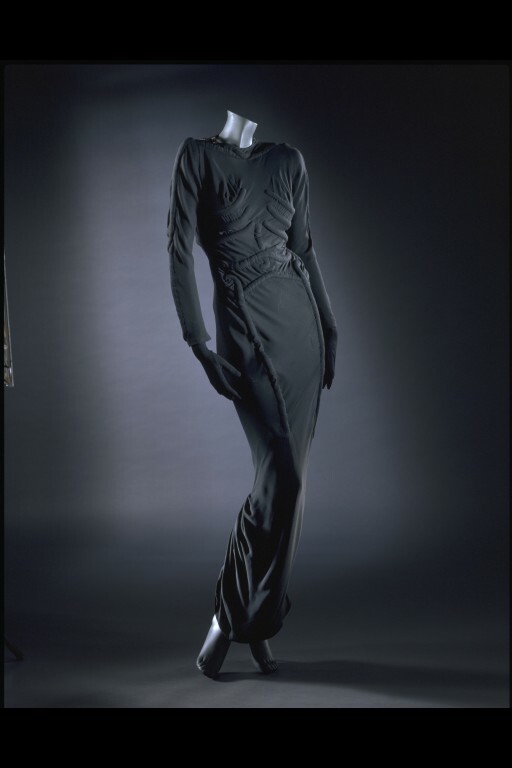 Evening dress and petticoat of silk crêpe, 'The Skeleton Dress', designed by Schiaparelli and Salvador Dalí, Paris, 1938.